BACKGROUND AND PURPOSE: Qualitative CT perfusion (CTP) assessment by using the Alberta Stroke Program Early CT Score (ASPECTS) allows rapid calculation of infarct extent for middle cerebral artery infarcts. Published thresholds exist for noncontrast CT (NCCT) ASPECTS, which may distinguish outcome/complication risk, but early ischemic signs are difficult to detect. We hypothesized that different ASPECTS thresholds exist for CTP parameters versus NCCT and that these may be superior at predicting clinical and radiologic outcome in the acute setting. MATERIALS AND METHODS: Thirty-six baseline acute stroke NCCT and CTP studies within 3 hours of symptoms were blindly reviewed by 3 neuroradiologists, and ASPECTS were assigned. Treatment response was defined as major neurologic improvement when a ≥8-point National Institutes of Health Stroke Scale improvement at 24 hours occurred. Follow-up NCCT ASPECTS and 90-day modified Rankin score (mRS) were radiologic and clinical reference standards. Receiver operating characteristic curves derived optimal thresholds for outcome. RESULTS: Cerebral blood volume and NCCT ASPECTS had similar radiologic correlations (0.6 and 0.5, respectively) and best predicted infarct size in the absence of major neurologic improvement. A NCCT ASPECT threshold of 7 and a cerebral blood volume threshold of 8 discriminated patients with poor follow-up scans (P < .0002 and P = .0001) and mRS ≤2 (P = .001 and P < .001). Only cerebral blood volume predicted major neurologic improvement (P = .02). Interobserver agreement was substantial (intraclass correlation coefficient, 0.69). Cerebral blood volume ASPECTS sensitivity, specificity, positive predictive value, and negative predictive value for clinical outcome were 60%, 100%, 100%, and 45%, respectively. No patients with cerebral blood volume ASPECTS <8 achieved good clinical outcome. CONCLUSION: Cerebral blood volume ASPECTS is equivalent to NCCT for predicting radiologic outcome but may have an additional benefit in predicting patients with major neurologic improvement. The most widely used imaging technique for acute stroke remains noncontrast CT (NCCT). The reliability of early subtle ischemic sign detection in middle cerebral artery territory is improved with experience,1 clinical history,2 stroke window width and level,3 and the use of the Alberta Stroke Program Early CT Score (ASPECTS).4 NCCT ASPECTS allows a rapid and reliable assessment of stroke extent and has been shown to correlate with final infarct size.5 The combination of the ASPECTS, which is weighted for clinically significant regions, and CT perfusion (CTP), which can distinguish salvageable tissue from infarct core, suggests added benefit over NCCT alone for clinical outcome. Although multiple factors influence stroke outcome, knowledge of cerebral blood volume, cerebral blood flow, and mean-transit-time thresholds for outcome may influence the decision for thrombolysis treatment. The aim of the study was to evaluate whether in the acute CT assessment of infarction, ASPECTS scoring of CTP has higher predictive value than NCCT for the final infarct size and clinical outcome. We also sought to determine and test thresholds predictive of outcome in patients. This was a retrospective study of consecutive tissue plasminogen activator (tPA)–treated patients presenting between January and June 2005. Patients were included if they presented with suspected acute stroke within 3 hours of onset, underwent a CT stroke protocol (including CT angiography [CTA] and CTP), were treated with intravenous thrombolysis, and were followed up at 5–7 days. A standard tPA administration regime was used (0.9 mg/kg dose, 10% bolus, 90% continuous infusion for 1 hour). Recanalization data were variably collected because of differences in practice of clinicians and did not exclude the patient from participation. To determine prediction of presentation perfusion parameters with radiologic outcome, we dichotomized patients into 2 groups: those with a major neurologic improvement and those without. Major neurologic improvement was defined in accordance with previous publications, as ≥8-point National Institutes of Health Stroke Scale (NIHSS) improvement at 24 hours after tPA.6–8 Major neurologic improvement was used as a surrogate marker of response to treatment on the basis of the following rationale: Secondary analysis by the National Institute of Neurological Disorders and Stroke investigators demonstrated that this magnitude of improvement discriminated between the treatment and placebo group without overlap in the confidence intervals (CIs).6 This degree of improvement is an independent predictor of good 90-day outcome.7 Major neurologic improvement has, therefore, been interpreted in this study and others as a marker of treatment efficacy and has been suggested as a surrogate marker for clinical efficacy and a possible marker of recanalization.8,9 The NIHSS was recorded by an experienced stroke neurologist with NIHSS certification. Thirty-nine patients met the criteria and constituted the study group; 3 were subsequently excluded on the basis of suboptimal CTP image quality. NIHSS at presentation, the change in NIHSS at 24 hours after thrombolysis, and 3-month modified Rankin Scale (mRS) scores were recorded. An mRS ≤2 at 3 months was considered a good clinical outcome. Local institutional review board approval was obtained. The CT stroke protocol using a 4-section CT scanner (LightSpeed; GE Healthcare, Milwaukee, Wis) comprised pre- and postcontrast head scans from the skull base to the vertex. Imaging parameters were the following: 120 kVp, 340 mA, 4 × 5 mm collimation, 1 s/rotation, and table speed of 15 mm/rotation. CTP parameters were the following: 45-second cine scanning (80 kVp, 190 mA), 3- to 5-second delay, injection of 0.5-mL/kg (30–50 mL) iohexol (300 mg/mL; Omnipaque, Nycomed, Princeton, NJ) at a rate of 4 mL/s. CTP studies covered a 20-mm slab with four 5-mm sections carefully positioned to allow visualization of the sections required for ASPECTS scoring from the basal ganglia to the centrum. This was achievable in all patients (Fig 1). CTA covered carotid bifurcations to the vertex with the following parameters: 0.7-mL/kg iohexol (maximum, 90 mL); 5- to 10-second delay; 120 kVp; 270 mA; 1 s/rotation; 1.25-mm-thick sections; table speed, 3.75 mm/rotation. For each CTP study, a time attenuation curve was made, displaying the change in Hounsfield units for a specified region for the duration of the scanning. Arterial and venous input functions were obtained from the ipsilateral anterior cerebral artery and from the superior sagittal sinus, respectively. CT Perfusion 3 (GE Healthcare) was used to calculate parametric maps of cerebral blood flow and cerebral blood volume by deconvolution of tissue-enhancement curves and arterial time-attenuation curve in 2 × 2 pixel blocks. Mean-transit-time maps were also calculated. Partial volume averaging of the arterial input curve was corrected by using the venous time-attenuation curve. A 75-year-old man, within 2 hours of right-sided stroke and presentation of NIHSS 20. A, NCCT demonstrates subtle loss of the left posterior putamen, internal capsule, and posterior insular cortex (white arrowhead) (ASPECTS 7). B, Cerebral blood flow. C, Cerebral blood volume. D, Mean transit time. Cerebral blood volume demonstrates an abnormality confined to the posterior putamen and internal capsule (ASPECTS 8), with larger cerebral blood flow and mean-transit-time abnormalities corresponding to the left middle cerebral artery M1 segment occlusion (not shown). E, Follow-up NCCT at day 6 shows an indistinct posterior putamen confirmed on diffusion-weighted MR imaging (F). The patient recovered by 18 points with a final NIHSS of 2. Three reviewers (2 neuroradiologists and a neuroradiology fellow) read a number of mock cases and agreed by consensus on the method of ASPECTS scoring on CTP, according to a previously published method for NCCT.4 A qualitative approach to CTP was adopted, scoring any perfusion abnormality. Absolute perfusion values were not considered. By agreement, only images from the anterior commissure to the section above the lateral ventricles were reviewed on NCCT. Readers were blinded to clinical information and randomly reviewed the studies on a PACS workstation (Version 3.1; Agfa, Waterloo, Ontario, Canada). 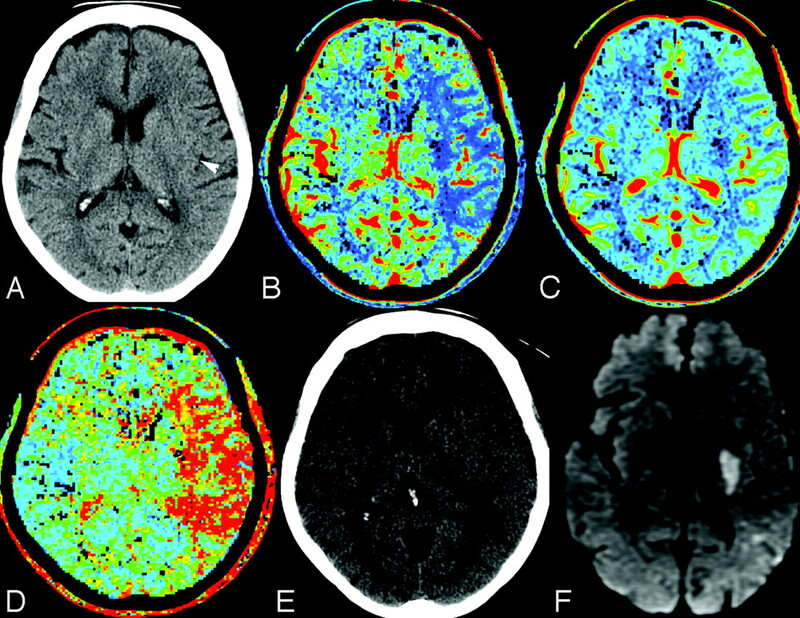 Perfusion abnormality was scored by using ASPECTS for each of the cerebral blood volume, cerebral blood flow, and mean-transit-time maps; and the affected side was recorded. A delay of 1 week between each sequence read was instituted to avoid recall bias. The final NCCT ASPECTS was scored separately by 2 experienced readers without knowledge of previous imaging. Data were transferred to and analyzed in Statistical Package for the Social Sciences (Version 10; SPSS, Chicago, Ill). Median ASPECTSs for the presentation and follow-up NCCT and CTP parameters were compared by using paired t tests, dichotomizing patients according to recanalization implied by NIHSS improvement as discussed previously. Pearson correlation coefficients were computed between ASPECTS for NCCT, cerebral blood volume, cerebral blood flow, mean transit time, and radiologic NCCT outcome. Median ASPECTSs for each CT parameter were compared for patients having good and bad clinical outcome (mRS, ≤2 or ≥3, respectively) by using unpaired t tests. For each sequence and follow-up NCCT, receiver operating characteristic (ROC) curves were computed with the dichotomized mRS as the reference outcome; the optimal threshold for predicting outcome was defined as that which gave maximum accuracy (sensitivity plus specificity). Using these optimal thresholds in our patient group, we calculated rate ratios and reported the optimal positive and negative predictive values for identifying good clinical outcomes. To assess agreement among readers for ASPECTS as a continuous variable, we computed the intraclass correlation coefficient (ICC). For all analyses, statistical significance was determined as P < .05. There were 18 female and 18 male patients. The median age was 75 years (range, 35–95 years). Median NIHSS was 15 (range, 6–30) at presentation. The median time to presentation from symptom onset was 165 minutes (range, 84–180 minutes). Median NIHSS 24-hours post-tPA was 4 (range, 0–46). Median hospital length of stay was 11 days (range, 1–110). The location of thrombus demonstrated on presentation CTA was the M1 segment in 16 patients and the M1–4 segments in 20 patients. No inferior cerebellar artery, posterior inferior cerebellar artery, or anterior cerebral artery infarcts were present. Left-sided infarcts occurred in 16 patients (44%). Hemorrhagic transformation (type 1 or 2) and parenchymal hematoma (PH 1 or 2) were seen in 8 (22%) and 6 (16%) patients, respectively. Major neurologic improvement was present in 7 patients. The median ASPECTS and level of significance for baseline NCCT, final NCCT ASPECTS, and CTP are given in Table 1. The mean cerebral blood volume and NCCT ASPECTS at presentation most closely predicted final NCCT ASPECTS in patients with major neurologic improvement. In the absence of such improvement, cerebral blood flow and mean-transit-time values most closely agreed with final NCCT ASPECTS. A correlation matrix was determined for each CTP parameter predicting final NCCT ASPECTS. NCCT and cerebral blood volume ASPECTS (r = 0.6 and 0.5, respectively) were superior to mean transit time or cerebral blood flow (r = 0.4 each) in patients who showed major neurologic improvement. In the absence of such NIHSS improvement, cerebral blood flow and mean-transit-time ASPECTS (r = 0.6 each) were superior to cerebral blood volume and NCCT (r = 0.5). An ASPECT threshold of 7 and cerebral blood volume threshold of 8 at presentation discriminated patients with poor follow-up findings on scans (P < .0002 and P = .0001, respectively). In patients with no major neurologic improvement, cerebral blood flow and mean-transit-time thresholds of 5 were predictive of radiologic outcome (P < .0001 each). ROC curves were drawn, and the areas calculated as 0.8 each for cerebral blood volume, cerebral blood flow, mean transit time, and final NCCT ASPECTS; and 0.7 for baseline CT, respectively. Optimal thresholds were determined and are presented in Table 2. A cerebral blood volume threshold of 8 was the only presentation parameter to predict patients with major neurologic improvement (P = .02) (Fig 2). NCCT (P = .08), cerebral blood flow (P = .22), and mean transit time (P = .20) did not reach significance. The mean NIHSS at 24 hours in patients presenting with cerebral blood volume ≥8 was 7.3 (SD, ±6.7) versus 16.4 (SD, ±6) in patients with cerebral blood volume <8 (P = .0004). Major neurologic improvement predicted a good clinical outcome in 86% of patients with sensitivity, specificity, positive predictive value, and negative predictive value of 96%, 67%, 89%, and 86%, respectively. 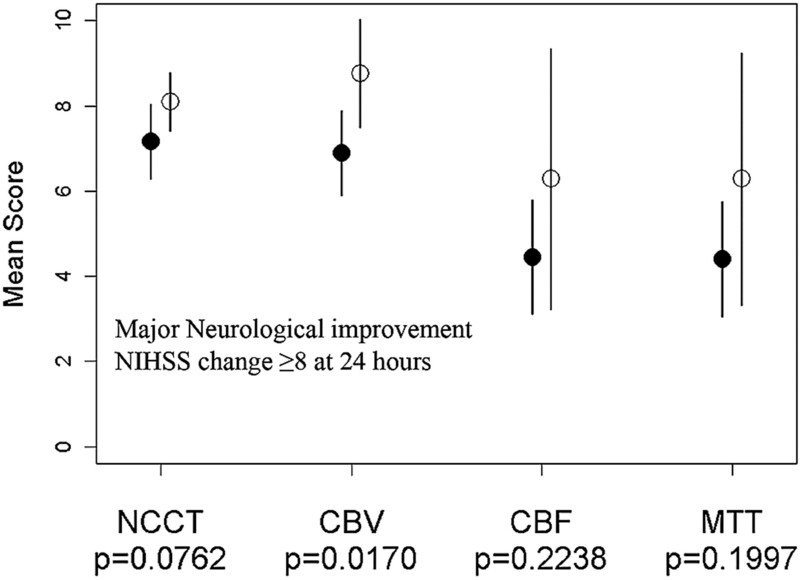 A plot of mean baseline ASPECTS NCCT, cerebral blood volume (CBV), cerebral blood flow (CBF), and mean transit time (MTT) against major neurologic improvement, demonstrating that only CBV is predictive of 24-hour NIHSS change. Figure 3 demonstrates that the greatest discriminator of clinical outcome was the follow-up CT ASPECTS (P < .001), followed by cerebral blood volume (P < .001). Sensitivity, specificity, positive predictive value, and negative predictive value for cerebral blood volume ASPECTS was 60%, 100%, 100%, and 45%, respectively. Values for initial NCCT ASPECTS were 63%, 89%, 94%, and 44%, respectively. 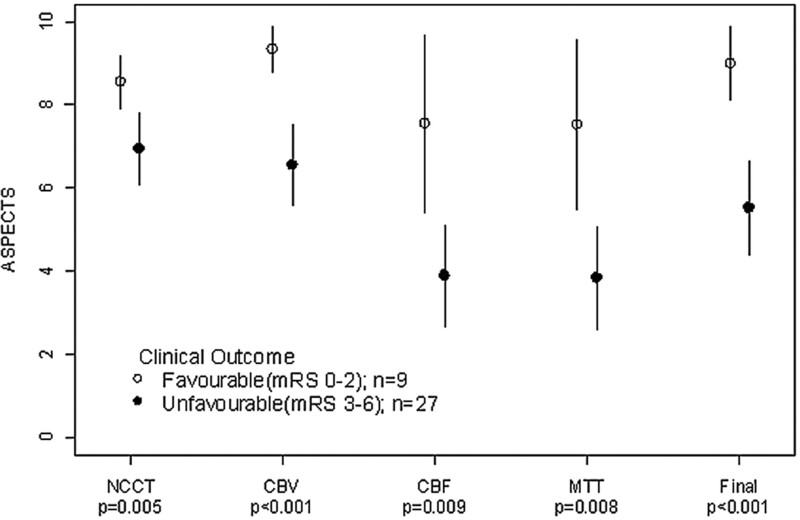 No patients with a cerebral blood volume threshold of <8 had an mRS ≤2 at follow-up. However, the prognosis for patients with cerebral blood volume ≥8 was more variable, with only 45% achieving an mRS ≤2. However, 70% achieved an mRS ≤3 with only 1 false-negative (6%) (Table 3). There was no difference between mean transit time and cerebral blood flow for clinical outcome (P = .008 and .009). The sensitivity and specificity were 67% and 70%, respectively. A plot of mean baseline ASPECTS NCCT, cerebral blood volume (CBV), cerebral blood flow (CBF), and mean transit time (MTT). Results are dichotomized for clinical outcome by using 2-sample t tests. Favorable outcome was defined as mRS ≤2. Comparison of mean clinical outcomes was based on dichotomized mRS (0–2 versus 3–6), by using unequal variance 2-sample t tests. The ICC for each CT parameter is given in Table 4. Cerebral blood volume agreement was slightly higher than NCCT agreement, but both demonstrated comparable CIs. The ICC for cerebral blood flow and mean transit time was high, with narrow CIs. We demonstrated that a cerebral blood volume ASPECTS threshold of 8 discriminates patients who experience major neurologic improvement and have good clinical outcome at 3 months (mRS ≤2). The ability of a cerebral blood volume ASPECTS threshold at presentation to predict major neurologic improvement has not previously been described, to our knowledge, and has important clinical implications. Major neurologic improvement is defined as NIHSS improvement ≥8 points. It is usually determined by subtracting the post-tPA treatment NIHSS from the presentation score. Major neurologic improvement is considered a marker of treatment response and thought to reflect recanalization.8,9 Major neurologic improvement and 24-hour NIHSS are known to strongly discriminate 90-day outcome with an area under the curve for 24-hour NIHSS of 0.71.8–10 In our study, baseline cerebral blood volume ASPECTS was the only parameter to discriminate patients who showed major neurologic improvement. This improvement was also associated with the highest accuracy for prediction of 3-month clinical outcome. Our findings suggest that ASPECTS scoring of cerebral blood volume may provide additional clinical prognostic information not available on NCCT. In this series, patients with a cerebral blood volume ASPECTS <8 treated with thrombolysis did not have a good clinical outcome. The prognosis is more guarded when the cerebral blood volume is ≥8, with an outcome of mRS ≤2 in only 45% of patients, and is consistent with a recent report of ASPECTS in the Canadian Alteplase for Stroke Effectiveness Study dataset.10 The rate of patients’ achieving mRS ≤3 was 70%, also consistent with the previously mentioned study with 1 false-negative (6%). CTP has a spatial resolution (1.5 × 1.5 × 3 cm) similar to that of MR perfusion but is limited by spatial coverage, ionizing radiation, and iodinated contrast injection. Despite limited 2-cm coverage on a 4-section scanner, a carefully positioned slab ensures that the ASPECTSs were highly correlated with final infarct volume and clinical outcome. A recent study has evaluated the dose obtained at CTP. With commonly used parameters, the dose of 1.1–1.3 mSV is lower than that in NCCT. The dose was recorded for a 64-section scanner over 2.4 cm, which is greater than the 2 cm achievable on a 4-section scanner.11 In clinical practice, we do not repeat the CTP study if movement occurs. It is often possible for the CTP raw data to be edited and the sections with movement to be eliminated. Nevertheless, 3 studies in this consecutive series were uninterpretable. The score is robust and unaffected by scanning angle or interpretation of extent of middle cerebral artery territory.12 In comparison with more elaborate and time-consuming perfusion threshold or volume measures13–17 for determining final infarct size, the ASPECTS scoring of CTP may seem relatively crude. We believe that this simplicity is its strength, and we have shown that CTP ASPECTS correlated well with final NCCT ASPECTS. The extended coverage that a 64-section scanner or other techniques (such as table toggle18 or double injection19) provide, however, may allow greater final infarct volume correlation. At acute stroke presentation, limited data are available to guide thrombolysis decision-making or to provide prognostic information. Conflicting data exist as to whether patients with early ischemic signs are at higher risk for poor outcome and thrombolysis-related complications, based on NCCT interpretation.20–28 Although there is a general pattern of worse outcome when the hypoattenuation is widespread (ASPECTS >7 or 1/3 middle cerebral arteries19–23), only 3 studies have looked directly for an association between such patients and thrombolysis treatment and have found no such interaction.25–27 Early ischemic changes are difficult to detect on NCCT, with low interobserver agreement for presence and extent.29,30 Whereas loss of gray-white differentiation is consistent with infarction,31 cerebral swelling may be intermixed, extending the apparent boundary of infarct. Cerebral swelling is associated with a variable and lower stroke risk32 and may account for overestimation of initial infarct size on NCCT. Use of ASPECTS on CTA signal intensity allows easier detection of the infarct extent and provides additional information.5 When compared with NCCT, the median cerebral blood volume ASPECTS was higher and lower in patients with good and bad outcome, respectively. A single previous study in the neurology literature has looked at ASPECTS interpretation of CTP and reported benefit of cerebral blood volume ASPECTS over NCCT.33 However, a lower threshold of 6–7 was used, resulting in a false-negative rate of 13%–18%. In conclusion, a threshold of 8 applied to the ASPECTS interpretation of cerebral blood volume is equivalent to that of NCCT for radiologic outcome and may confer some advantage over NCCT at predicting 24-hour improvement and final clinical outcome. The results of our series indicate that patients treated with thrombolysis presenting with a cerebral blood volume ASPECTS of <8 have a poor outcome. Accepted after revision April 2, 2007.